Each morning’s news seems to bring another fund-raising announcement of ever larger scale. Just a few months ago, Pure Storage raised $150M in the largest ever venture investment in a storage company. These record financings certainly generate significant press interest. But how representative of the fund raising environment are these mega-rounds? The chart above breaks down fund-raising activity in US tech companies using Crunchbase data. 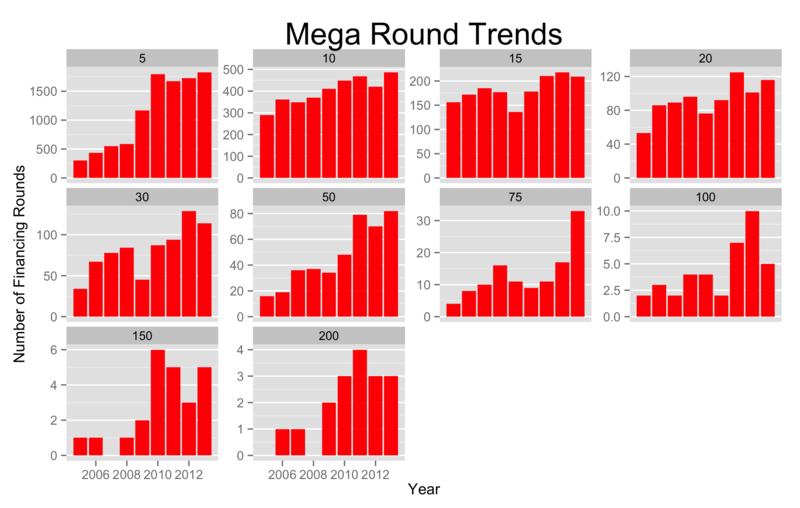 Each chart shows the number of rounds raised bucketed by size from $0 to $5M and up to $150M to $200M from 2005 to 2013. Each bucket has grown over the past 8 years and most of them steadily. But there are a few outliers. $75M investments spiked in 2013. $150M and $200M investments have been relatively stable over the past four years. In addition to looking at gross numbers, let’s compare the growth rates from 2009 to 2013 of each of these buckets. The data proves what impressions from press suggested: the number of mega-rounds has increased by 150%-200% in the past four years. 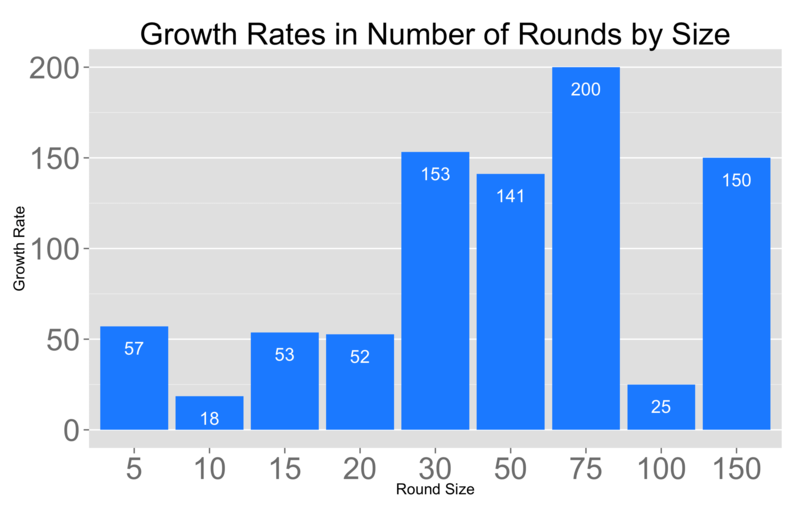 $30M-$50M and $150-$200M rounds rounds are 1.5x more common in 2013 as 2009 and $75-100M rounds have doubled during this time frame. The smaller, presumably earlier stage investments are growing at a good clip, too - about 50%. Interestingly, the number of rounds has a 0.977 R^2 value to dollars raised, meaning investors are pushing more and more capital through the ecosystem at effectively the same growth rates as the ones in the chart above. All of this is good news for entrepreneurs. There is more capital flowing through the ecosystem than four years ago. Additionally, there are investors that are increasingly willing to invest IPO-sized chunks of capital into private companies, enabling them to grow more, potentially acquire other companies and avoid the costs of going public until later. Needless to say, it’s boom times.